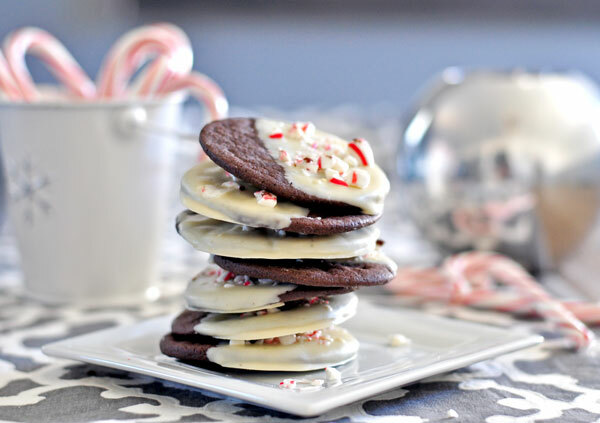 But Chocolate Peppermint Cookies are definitely a symbol that the Holidays are here. 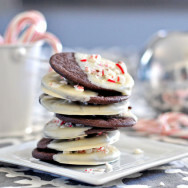 The chocolate cocoa cookie has a deep rich chocolate and peppermint flavor. 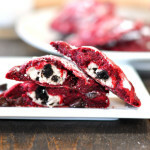 It’s crisp on the outside but still slightly chewy on the inside, then dipped in white chocolate and topped with crushed candy canes, my favorite part! You can’t get more festive than that! This is the best after dinner cookie with a baileys & coffee after dinner drink. 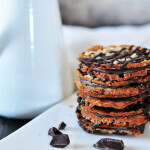 This recipe calls for Dutch Processed Cocoa. 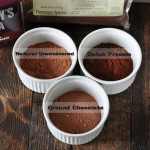 When it comes to cocoa powder, I always prefer dutch processed cocoa because it creates a richer darker color and flavor and makes for a denser fudgy-er cookie. I actually just did a post “What is dutch processed cocoa” that explains the difference between dutch processed cocoa and the more common natural unsweetend cocoa. The difference is subtle so if you don’t have dutch processed cocoa you can substitute the natural unsweetend cocoa instead just keep in mind your end cookie will be slightly different. 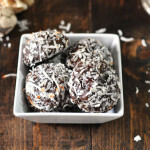 When substituting dutch processed cocoa for natural cocoa in this recipe you can do a one to one substitution because it already calls for baking soda. This recipe also requires refrigeration time. I know most of my recipes do, but trust me it really makes a difference in the end cookie. Letting the flour chill out enhances the flavor and reduces the amount of spread the cookies will have in the oven, which will help keep them chewy. This recipe also calls for melted butter so yay!! no need to soften your butter…that’s a total plus but also why the dough requires refrigeration time. After the cookies have been refrigerated for at least an hour and up to a couple days, you can begin making them festive! First you will need to lightly flour the surface to roll out the dough. 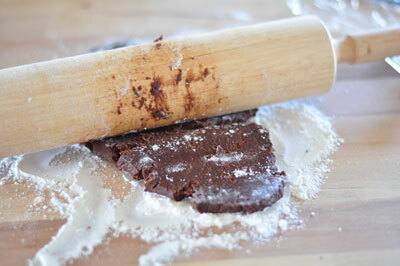 The dough can get pretty sticky so make sure your flour your rolling pin if you are using a wooden one. I really need to invest in a silicon rolling pin…. You will then want to freeze the cookies for a about 15 minutes before baking. This will keep the spreading to a minimum when the cookies are in the oven. While the cookies are cooling, you can prepare the white chocolate for dipping. 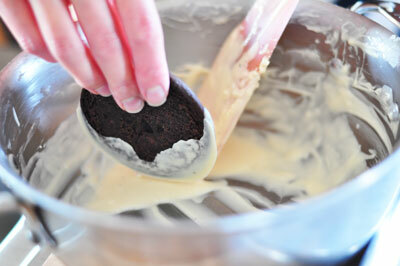 Make sure the cookies are completely cool before dipping in the white chocolate. I always prefer melting chocolate in a double boiler which is a basically a glass or metal bowl placed on top of a pot with a little bit of steaming water that does not touch the bowl. There is less chance of burning the chocolate in a double boiler than the microwave and it is seriously just as easy. 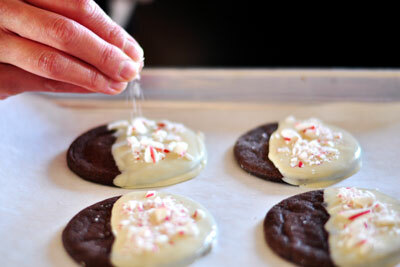 And sprinkle with crushed candy cane! The best way to crush the candy cane is to stick them in a zip lock bag and pound with the rolling pin. These crush quickly so make sure you don’t completely pulverize it. Preheat oven to 325 degrees F and line your baking sheets with parchment paper. 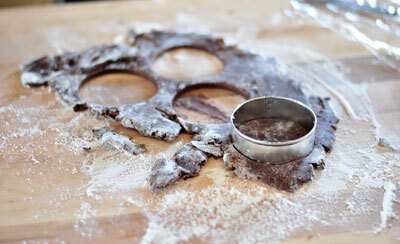 Roll out the dough to about 1/4 inch thick and cut out round circles using a cookie cutter or a glass. Place on the baking sheet about 1 inch apart and freeze cookies until firm. About 10-15 minutes. While the cookies are cooling. 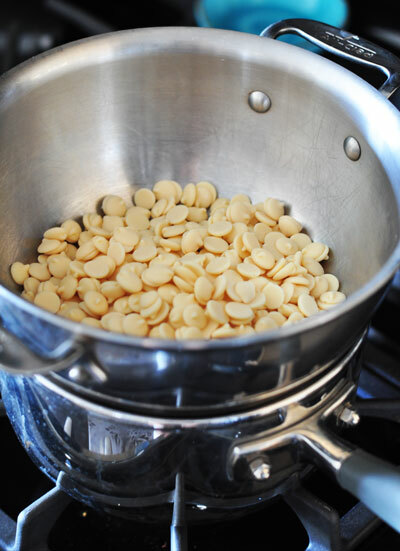 Melt the white chocolate in a double boiler. When the cookies have cooled completely. Dunk half of the cookie into the white chocolate. You may need to use a spatula to push the white chocolate up the cookie to cover half of the cookie, especially when the white chocolate coating gets low. 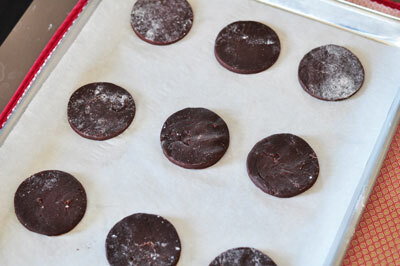 Sprinkle with the crushed candy can and place on parchment paper to cool and dry. You can totally freeze these cookies for about 2-3 months. 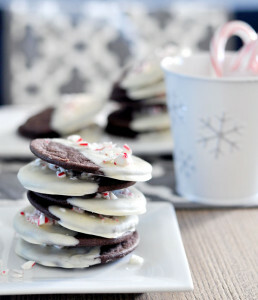 I would just wait to decorate and top with the crushed candy canes because they will get soggy when it is defrosting. I love frozen cookies! Does step 3 call for combining wet and “dry” ingredients? It says combine wet and wet now. Good catch! I just changed it! Thank you! Yes combine wet withe DRY ingredients! These cookies look very beautiful! Hey, how much cookies are made with this recipe? How do think this would take to doubling? This actually makes quite a few cookies. You’ll probably get 28-32 cookies depending on how big you make them. You can definitely try doubling the recipe. It doesn’t always work out perfectly though and it’s hard to know until you actually try it. I would start by doubling the batter then baking a test cookie to see how it turns out. You can then adjust the result from there. If you want them to spread more try adding more sugar or more butter. If they are spreading too much add a little flour. You can also up the flavorings if you need it more minty. Let me know how it goes! 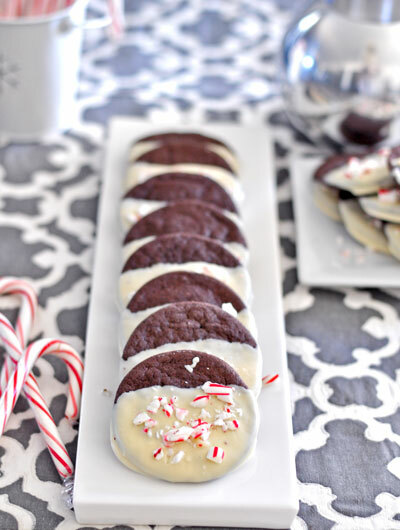 I agree, it’s not Christmas without peppermint and chocolate! These are perfect! Simple yet pretty and yummy looking! (Saw you on “TheBerry” by the way! Thanks Renee! So funny I’ve been seeing traffic from The Berry and had no idea what it was. I’ll have to check it out! Thanks so much for stopping by! I love peppermint and chocolate! 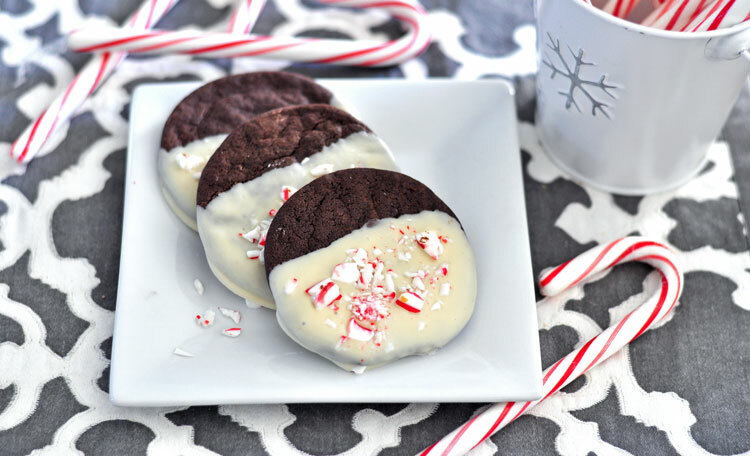 the white chocolate and peppermint sounds yummy!